Also make sure to check out the adorable bags I posted about yesterday, if you missed it! So….Let’s just get this out of the way, I’m not pointing to my “guns” in this pic. (impressive as they might be…snort/giggle) I’m dorkily pointing at my sewing machine. Yep, I’m just that cool. I was hoping to enlist your help…my about me page is kinda random…. (don’t go look now! pretty please?) I’m taking a bloggy page out of Kate’s book and opening the floor to you for questions. Have you ever wanted to ask me something? Like…..How old are you? (26) What is your favorite color? (teal) Are you really this dorky in real life? (yes.) See how that works? I can’t promise to answer all of them, but I’ll do my bestest. And in return, you may just help me write a more fun about me page-and maybe answer some FAQ’s. I’ll give away a yard of surprise fabric from my stash to one randomly-drawn questioner-person. (aka ask a question, get entered.) Now, that’s incentive, huh? How do you find time to sew with 2 little ones? I have a 3 year old and a 1 1/2 year old who never give me time to sew. I would love to know your secret! As a person who just bought there first sewing machine last week, what are a couple of tips you would give someone starting to make baby/children’s clothes? What is currently your favorite line of fabric? Random, but how many kids do you want to have? I picture you with a slew of cuties! Who inspired you to begin sewing? What’s your best tip for a beginner sewer who is a bit scared of the whole thing? What kind of sewing machine did you get???? How did you come up with your daughter’s names? And…where did you first learn to sew? What has been your favorite project to date? And WHY do you sew? Not gonna lie, my first thought was “Welcome to the gun show” haha. hmmmm… I will provide you with some absolutely random and ridiculous questions. If you were feeling super daring, what color would you put in your hair? What chore would you beg, borrow, or steal in order to avoid? What is your favourite way to eat bacon? How did you and Rory meet? How long did it take to know that you wanted to marry him? Here are all the questions that popped into my head… some are random- don’t laugh!! why did you learn to sew? where do you want to be in 5 years, 10 years? Is your hair naturally straight? How many siblings do you have, are you close? Do you like to read? If so, what are your favorite books? Do you plan on having more kids? how did you come up with your girls’ names? Hmm I’ve always wondered how you balance it all. Are you just a really fast sewer? Good at time management? Also where are your favorite places to shop? You have some cute clothes. where is your favorite place to shop for inspiration? How the heck do you find time to make so many things? Who or what inspires you? Have you ever sewn something for Rory? What is your favorite crafty-tool, besides the sewing machine? What is the weirdest thing you have ever made? What was your biggest crafty fail? Where do you get inspiration for making your own patterns? q: what is your favorite vegetable? What would you have to be bribed to eat? Where do you find your inspiration for color combinations before you start sewing a quilt? What are 5 things on your bucket list? Do you knit? Crochet? If not, will you learn how to soon. If you didn’t sew, what could you see yourself doing creatively? How do you come up with your amzingly creative ideas?! What made you decide to start a blog? I’ve been thinking about starting one myself for a while now, but haven’t taken the plunge yet. Also, for a non-craft related question – what is the worst thing you ever ate? If the grochery store was having a HUGE BOGO on all cereal what two (different) kinds would you choose? What’s the one thing you like least about sewing? Why did you begin blogging/what inspired you to begin blogging about what you blog about? I enjoyed Dana’s post on Made recently about her fashion style (where she shops, what she likes to wear) – how about something regarding your style? That’s all I can think of now! Congrats on the .com. I can’t wait for the new About Me page!! What does your sewing room look like? Besides the type of sewing machine someone has, I’m always curious to know where a person sews! Is it on top of the washing machine or are you lucky enough to have your very own room. Can’t wait to see your new about me page. What is the number one value that you want to instill in you kids? Who are adorable by the way! Do you stick to a craft budget and what is it? …. is that too personal??! …Where do you get most of your fabric? what is one tip you would give to a newbie interested in getting started on sewing? Where to start? What is a must have? Do you have a favorite TV show? What’s your favorite thing to drink? Who is your favorite band? Do you have a “craft fail” and if so, what is it? I saw that someone else asked this-interested in how you and your husband met. When you are fabric shopping, and you see a fabric you LOVE, MUST HAVE, ETC., how much of it do you buy? One yard is nice but most projects/patterns seem to take more. If I don’t have anything specific in mind, I never know how much to get… How much would YOU buy? so many Qs. What was your first craft? Where did it all start? How did you get into blogging? How do you find time to craft? What is your go-to fabric store? Favorite craft? Favorite pattern? One type of pattern you just can’t resist? I love anything for my daughter. This could go on forever. First of all, I love your blog…I visit almost daily to see what is up. I also love that you post blogs that you love…I have gotten so many good ideas from those girls! Knowing that the large majority of your visitors will be women, and knowing how we LOVE details, I’d like to hear more about your life; before blogging and now. Your pics are great, and you update so often on your blog, that we are kept in the loop with how the kiddos are growing. (Love the cheeky pics of Charlotte – I have a very cheeky granddaughter myself!) I really like Me Sew Crazy’s About Me section. You are doing a fabulous job, BTW! How did you decide on a sewing machine to buy? Any tips for someone looking for a new one? Where do you buy your fabric? What’s your favorite way to add a little character to your creations? That is a good incentive! Ok. Here is my question. 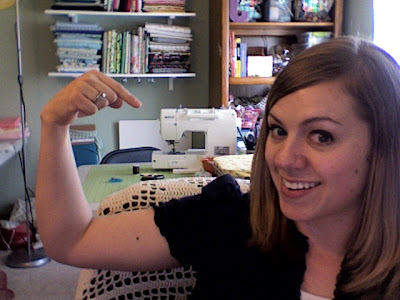 Do you have a sewing nemesis? Some technique that gets you every time? What is your favorite sewing project of all time? Wow, so many great questions have already been asked! While I know your girls aren’t always happy about posing for your adorable pictures, do they wear what you make for them in ‘real life’? Do you have a sewing budget? Where do you find the time w/ little ones running around? How do you stay organized with all your sewing patterns? PS! I love your blog! When did you first start to sew? Who taught you? What is your favorite thing to make for others? What is one surprise tool that you use in your sewing experience? I’m looking for something cool and useful. How and when did you learn to sew? Also, do you do other crafts (like knitting, crocheting, etc.)? Where is your favourite holiday spot? and what it your favourite chocolate? Have you been to stone mountain and daughter in berkeley? I live in the uk, but lived in ca for a few years (my dh is from CA)…..I miss that shop Big Time! Hey, Jess! Just wanted to let you know that your picnic guest post went up today on my blog! Thanks so much for participating in “Life’s a Picnic!” Loved the recipes you shared. As for “about you”… how about: What inspires you? Where do you find your motivation on those days that seem motivation-less? How do you balance it all? And why do you craft? What are your top 3 fav places you have visited? Top 3 places you would LIKE to visit? What’s the best advice you’ve ever gotten (sewing or otherwise)? I LOVE your blog! And your girls are DARLING!!!!! You are way talented – but what else would you like to learn to do / be better at? Have you ever ignored your gut telling you NOT to sew something and regretted it? If so what did you make, why didn’t it work, and what did you do with it? Do you ever get any rest??!! How do you come up with your own designs? Can you stop yourself sewing? Do you dream about sewing? Do you find yourself sneaking into to sew when you shouldn’t really? What inspired you to start this blog? Where did you learn to sew? Did your mother sew for you too? I really want to know where you learned to sew!!! I am so impressed with all of your projects, and yeah… where do you find time? What do your girls do while you are sewing? I want to know how you decided to start sewing, too, and what your sewing history is. Did you start at age 2? or home ec? or a couple years ago just for fun? Also, I’m curious about how you got your blog out there, and picked up so many followers. I mean, obviously, your blog is awesome. But how did you get it so popular? As a mom of 3 littluns under 4, I wonder how in the world you find time to craft?!!! When do you do it – do you sneak off to craft land when they’re sleeping, put on movies (my sanity sometimes!) or what? And how do you get perfect patterns every time. The first dress I made from your site, using my own pattern was hard to get on my daughter! what jessica were you named after? Oh boy you have lots of quEstions here already! I’m wondering how you’re going to get all of these answered! ?And how I’m so lucky to have a daughter the same size as yours! What is your least favorite chore? Easiest chore? Oh, and are you messy or a neat freak? I know, I know, two questions, but I couldn’t resist. 1)What do you when you find it hard to get inspired? 3)Did you plan your pregnancies? 4)Are you happy right this minute? 5)Is life different than you planned or are you living the dream? 6)Can I have Charlotte? jk! but I love those cheekies! Who was your favorite teacher who inspired you in some way and you’ve never forgotten? hah thanks for mentioning me! although I definitely didn’t invent the q + a.
teal is my favorite too! q: what is your favorite line of fabric? Where do you like to buy your fabric and do you have any tips for getting the quality designer stuff for a good deal? Are you guys thinking of having more kids? Hi, how do you recharge your energy when you are tired ? Where does your inspirations come from ? Great idea Jess and yay re the dot com. What’s the most loved thing someone has ever made for you? If you were to win a million dollars what would you do with it? Do you like cooking? What’s your facvourite dish/cake, thing to cook? Oh no…or icecream or baked goods?! What was the first thing you ever sewed and when? I want to know about your machines! what kind are they, do you like them, what do you not like about them, ect. How do you keep on top of your fabric stash?…it must be huge! I have so much trouble keeping mine tidy and actually organised enough to know what I have…Do you keep all of your offcuts? I’ve seen pics of your sewing room, but do you have fabric hidden away? Sometimes I can literally see you ‘churn’ out girl clothes, how long does it take you to sew up one? You seem mighty fast! How many hours do you spend in sewing a day, and what are the best times to sew (with 2 little girls around and house chores?). How many hours do you sleep a day? how do you find the time to finish things? I have about 12 crafting things going at once all the time. P.S. I have a toddler, a full time job, and a wonderful husband. Did you take a class to learn to sew? I am dying to know more than a straight stitch….not sure what direction to take to learn more! This is a great idea! I might, um, borrow it. =) My question: What’s your favorite flavor of ice cream? What is your favorite Ice Cream or Milkshake? Something I often wonder about… Do you ever feel “burdened” by your blogging gig? Do you ever want a break from sewing but feel you have to keep producing, producing, producing? Whew, I’m glad you’re back! I thought all of your tutorials (that I haven’t had a chance to try) had vanished into some internet void! I was going to ask how you have time to sew, but now I know: you’re 26! Seems so young to me now:) So, for fun, what is the first crafty thing you made for your husband? What was your very first favorite color or color combo? I remember being head-over-heels in love with blue and yellow. The combo still makes me wistful; like remebering my first crush. What is your current favorite color combo—what dominates your stash? First question: Do I get multiple entries for multiple questions? 3: What’s your favorite flavor of Girl Scout Cookie? 4: It’s raining in April-rainboots or flipflops? 5: How do you feel about garlic? Like many others, I would love to know how you get sewing/crafting done with 2 little ones underfoot. I have to save mine for naptime or late in the evening and I never get as much done as I’d like! Another question–what are some of your favorite inspirations for dreaming up new patterns? What’s your fave ‘veg in front of the TV’ snack indulgence?? very nice blog you have, thank you for the great ideas!!!! How many spools of teal thread do you own? What has been your most challenging or frustrating sewing project? Did you give up or embrace the experience? What do you enjoy most about blogging? This will be fun to get to know more about you! -Did you ever picture yourself being a mother to two beautiful little girls ? I’ve got another question although it really doesn’t have anything to do with your about me 😉 Sorry. -How did you pick the names Sadie and Charlotte? What are some good designers of boy or unisex fabric? I have nephews, no nieces, and every designer seems to want to put out a zillion flower and pink designs! If you had to pick one craft to make every time you craft for a year, and that is the only craft you could make, what would it be and why? Ok, you have probably answered this before, but I can’t find it on your blog. What kind of sewing machine and serger do you have? What is your favorite snack to eat when you take a break from crafting? If you could be any character in a Disney movie, who would it be? What song did you first dance to at your wedding? What is the one project that you are the most proud of? Why? Do you have a place where you can leave your sewing machine set up all the time or do you have to take it down between each use? I tried reading to not repeat, but wow, you have a lot of questions to go through! I would love to know what made you want to start blogging, and then why and when did you actually start? Also, do you ever run out of things to write about? What do you do if so? Holy questions, Batman! I’ll be interested to see your answers 🙂 Hmmm… Those of us who blog know that it isn’t always easy. What motivates you to continue blogging? what time you spend everyday in your blog? Do you think is to much or to little? Oooh, could be interesting if you answer all these questions! Are you a girly girl or next-door-neighbour girl or a tomboy? Hi Lucy-if you would email me directly at [email protected] we can take care of that, thanks! Are you considering putting the pinterest icon on your pictures. I would love to pin one of your tutorials. HOW EXACTLY IS IT THAT YOU MANAGE TO DO THE THING WITH A NEEDLE SO GOOD OK I DO FOR 300 YEARS AND STILL NOT BE AS GOOD AS OUY BE WHY YOU NOT SHASRE YOUR GOODNESS WITH DA REST OF US????? I have sewn forever and am having my first baby girl grandaughter. ( I am 67!) I don’t seem to be able to get a pattern of your Bapron. Can you help?